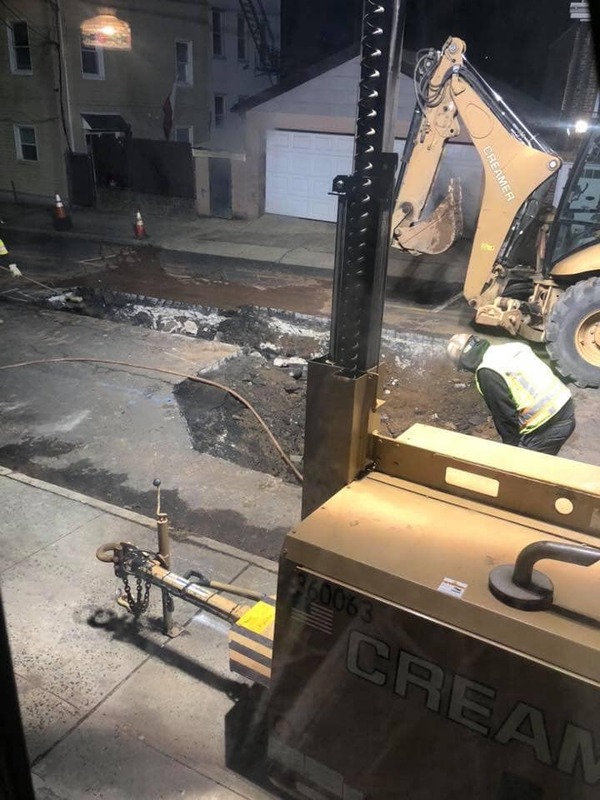 A sinkhole on 20th Street discovered on March 12 quickly escalated to a water main repair project. Photo by Chris Santiago. A jury found Scott Hahn, of Hamilton Township, guilty on all six counts related to the crash that took the lives of Bayonne resident Timothy O’Donnell, and his daughter Bridget, on Feb. 22, 2016. It took the panel less than a day to reach a verdict in a trial that lasted more than a week. That day, Hahn hit O’Donnell’s vehicle from behind at a toll booth at Interchange 14C of the NJ Turnpike while traveling 53 miles per hour. The crash was so severe that Assistant Chief Prosecutor Leo Hernandez said during his opening statement that it sent the victim’s car into oncoming traffic and caused injuries to Timothy, including cracked ribs on both sides and the severing of several major arteries that led to his near immediate death. Bridget died a short time later en route to Jersey City Medical Center. Her mother, Pam O’Donnell, has become an advocate for safe driving and has since launched the Catch You Later Foundation in honor of Timothy and Bridget. The Bayonne Economic Opportunity Foundation (BEOF) and BCB Bank are partnering to collect “gently used dresses and accessories” for local students to wear to proms. Collection boxes will be at BCB Bank on 591 Avenue C and BEOF Headquarters at 555 Kennedy Boulevard. A prom dress popup event will follow at BCB Bank on Saturday, March 30, from 10 a.m. to 2 p.m. Student ID is required. Attendees must RSVP by Friday, March 22, by visiting https://www.eventbrite.com/e/promgraduation-dress-pop-up-tickets-57836038147. For more information, contact information@beof.org. State lawmakers approved two related bills on March 15. One measure would make mental health a subject children would learn in their earliest school years; it’s awaiting an Assembly committee hearing. Another bill set for committee review focuses on suicide prevention. It would, like the first bill, require the state Board of Education to change state-wide standards to require districts to incorporate the topic into lesson plans, beginning in elementary school, according to NJ Spotlight. During his State of the City Address on Tuesday, second-term Newark Mayor Ras Baraka said the city is in the early stages of developing a pilot to test the feasibility of a universal basic income program, according to TapInto Newark. A universal basic income would provide a minimum amount of money to be paid to all citizens. The idea, which is controversial, complex, and beset by “messy terminology,” might align with Sen. Cory Booker’s federal proposals, though Baraka did not confirm a partnership with the city’s former mayor. A third of Newark lives in poverty. On March 11, a state Assembly committee approved bills that would require New Jersey’s Public Trust Doctrine to cover coastal development and protection issues, according to the Associated Press. The Doctrine is based on a common law rule that entrusts public access to and use of waterways. After nearly eight years, a “bill of rights” for “authorized family members” of developmentally disabled residents in New Jersey has reached a crucial step: approval by the state Assembly Human Services committee. Another bill would require the state to formalize crisis plans and develop a uniform public health response for emergencies involving people with disabilities, according to NJ Spotlight. The state Assembly Law and Public Safety Committee approved a bill designed to help law enforcement officers in crisis, and to prevent suicide. “An estimated 159 officers took their own lives last year, compared to the 145 who died in the line of duty,” said Gordon Johnson (D-Bergen). The legislation proposes a statewide curriculum for all officers, from state and county police to campus law enforcement. Officers would be required to complete in-service training when they were hired, and every five years. The AARP’s New Jersey chapter protested a proposed $12 billion increase in utilities upgrades with a box of 23,000 postcards on March 13. The state Board of Public Utilities and Gov. Phil Murphy were in the “to” section. Several other groups, including the state chapter of the Sierra Club and the Anti-Poverty Network of New Jersey, were also in the “from” section. Residential electric rates in New Jersey are the ninth highest in the continental United States. In Bayonne, The city also sold off its water system in 2012 in exchange for a large lump sum of money to help fill the budget gap. The trade-off for property owners, however, has been water rate increases that have climbed more than 30 percent. Will paper voting machines actually happen by 2020? In Pennsylvania, all voting machines will be replaced by the primary election. But New Jersey has no such plans. Division of Elections director Robert Giles says the main issue is funding: with no push at the state level, the cost must be managed county-by-county. “We are doing what we can with the funding that we have and the situation that we’re in,” he told Philly.com. The Brennan Center estimates the statewide cost to be between $40.4 to $63.5 million. Many are advocating for switching to paper voting machines to prevent the risk of hacking and tampering with electronic ballots.